I guess April, along with being Spring Cleaning month, is going to be Indian food month here at Maxine Writes HQ. In my last entry about Butter Chicken, I mentioned rarely being able to find someone to eat Indian food with. My entrée of choice when I do get around to having Indian food is aloo gobi. 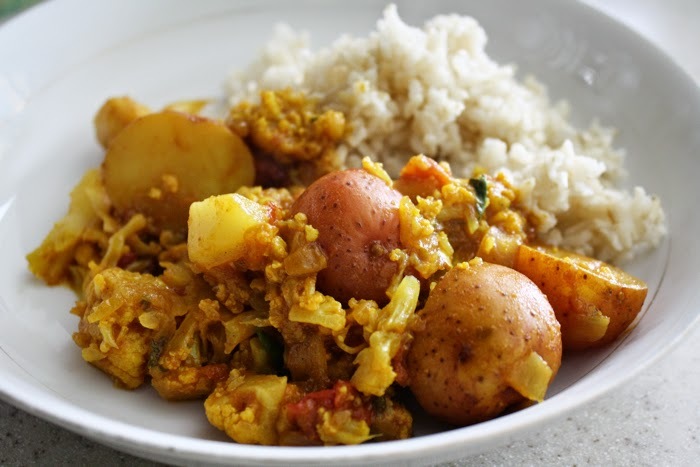 If you've never had aloo (potatoes) gobi (cauliflower), it's a dish made with ... potatoes and cauliflower and garam masala sauce, along with spices. I tried out a simplified (a.k.a. fewer unobtainable ingredients) recipe from Food.com user chuckdarwin and made some minor adjustments. Since it's a vegetarian dish, it really is quite easy to make -- and tasted just as I remembered it from the last time I had it ... a long time ago. Heat vegetable oil in a large saucepan. Add the onion and cumin seeds to the oil, stir and cook until the onions become golden and translucent. Add the cilantro stalks, turmeric, salt and chopped chilis. Stir in the tomatoes. Add the ginger and garlic and mix thoroughly. Add the potatoes and cauliflower to the sauce, along with a few tablespoons of water (ensuring that the mixture doesn't stick to the saucepan). Coat the potatoes and cauliflower with the sauce, cover and simmer until the potatoes are cooked (about 20 minutes). Add two teaspoons of masala and stir. Sprinkle the cilantro leaves on top of the curry, remove from heat, cover and leave for as long as possible before serving.